The civil war in Syria between rebel forces and President Bashar Assad’s Syrian army, escalated this weekend when Israel bombed Damascus, the capital of Syria. With its standard rationale familiar to Gaza residents, Israel released an official story that claimed the bombing was carried out for defensive purposes. The Reuters story in the Jerusalem Post, reported that the Israeli airstrikes, which killed “dozens of Syrian soldiers close to Damascus”, were “downplayed” by Israeli leaders. The “downplaying” consisted of Israel’s claim it was not attempting to influence the Syrian civil war, but wanted only to “stop Iranian missiles reaching Lebanese Hezbollah militants”. The Post rushed past the fact that “dozens of Syrian soldiers” were killed outside Damascus. There was no mention, not even a sympathetic nod to the possibility, that civilians may also have died in the attacks. Oil prices spiked above $105 a barrel, their highest in nearly a month, on Monday as the air strikes on Friday and Sunday prompted fears of a wider spillover of the two-year old conflict in Syria that could affect Middle East oil exports. Major General Yair Golan, Israel’s commander on both the Syrian and Lebanese fronts, was quick to reassure “fearful” Israelis. The general was out jogging with troops when a Reuters reporter caught up with him. He told the reporter, “There are no winds of war”. Then he added, “Do you see tension? There is no tension. Do I look tense to you?”. Israeli Prime Minister Binyamin Netanyahu was also calm. The Prime Minister had already begun a a scheduled visit to Beijing, which the Post story indicated was “an apparent sign of confidence Syrian President Bashar Assad would not retaliate”. Netanyahu received veiled criticism in Beijing where Chinese leaders urged “restraint without mentioning Israel by name”. China and Russia are the two major powers who are Syrian President Assad’s “protectors” in the UN Security Council. Russia said the strikes by Israel “caused particular alarm”, a mild reprimand to a nation that has just bombed a neighbor with whom it is not officially at war. President Vladimir Putin and US Secretary of State John Kerry were expected to meet Tuesday, the Jerusalem Post reported, “to try to tackle differences over the Syrian crisis”. In an Independent story that appeared January 25, before the Israeli bombing of Damascus, Russia’s Prime Minister, Dmitry Medvedev said that President Assad’s chances of retaining power in Syria are getting “smaller and smaller by the day”. “The statement is the most explicit admission from the regime’s chief ally that its days may be numbered, but Mr Medvedev also reiterated that the regime must not be toppled by external forces. The Syrian Observatory for Human Rights, an opposition monitoring group based in Britain, said at least 42 Syrian soldiers were killed in the strikes and 100 others were missing. Other opposition sources put the death toll at 300 soldiers, mostly belonging to the elite Republican Guards, a praetorian unit that forms the last line of defense of Damascus and is comprised mainly of members of Assad’s Alawite sect, an offshoot of Shi’ite Islam that has controlled Syria since the 1960s. As well as the heavily-fortified Hamah compound, linked to Syria’s chemical and biological weapons program, the warplanes hit military facilities manned by Republican Guards on Qasioun Mountain overlooking Damascus and the nearby Barada River basin. 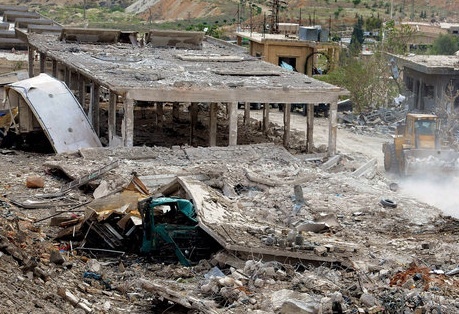 Residents, activists and rebel sources said the area is a supply route to the Lebanese Shi’ite militant group Hezbollah, but missiles for Hezbollah did not appear to be the only target. Air defenses comprising Russian made surface-to-air missiles and anti-aircraft guns on Qasioun and overlooking the rebellious Damascus district of Barzeh were also hit, they said. Their statements could not be verified due to restrictions on media. “The destruction appeared to be massive,” said one activist in Damascus, who did not want to be identified. Millions of Syrian refugees face food rationing and cutbacks to critical medical programmes [cq] because oil-rich Gulf states have failed to deliver the funding they promised for emergency humanitarian aid, an investigation by The Independent on Sunday has found. Arab states and aid groups, including Saudi Arabia, the United Arab Emirates, Qatar and Bahrain, have failed to deliver $650m (£420m) in pledges they made at an emergency United Nations conference in Kuwait four months ago. The severe shortfall, together with predictions that the Syrian refugee crisis could triple by the end of the year, is forcing UN aid agencies to plan for food rationing and to scale back health programmes including vaccinations. Akiva Eldar, former Ha’aretz columnist, introduced the notion of “Israel’s Moral Responsibility” in an Al Monitor column. Israel’s concern and sensitivity to the transfer of munitions to Hezbollah is understandable; what’s hard to accept is the indifference toward the plight of its neighbors exhibited by the country that prides itself of being “a villa in the jungle” and “the only democracy in the Middle East.” Jordan. Iraq, Lebanon and Turkey, the other countries bordering Syria, have already taken in hundreds of thousands of refugees fleeing the Syrian inferno. And Israel, the only country in the world that holds Syrian territory, keeps looking on from the sidelines. The policy of the Netanyahu government is reminiscent of the Begin government’s policy toward the horrible war between Iraq and Iran (1980-1988). Asked which side he supports, the late Prime Minister Menachem Begin answered with a smile: “We wish both sides the best of luck.” In Iran, by the way, they still remember this phrase. Few things are more ludicrous than the attempt by advocates of US and Israeli militarism to pretend that they’re applying anything remotely resembling “principles”. Their only cognizable “principle” is rank tribalism: My Side is superior, and therefore we are entitled to do things that Our Enemies are not. . . .
One could say quite reasonably that this is the pure expression of the crux of US political discourse on such matters: they must abide by rules from which we’re immune, because we’re superior. So much of the pseudo-high-minded theorizing emanating from [Washington] think thanks and US media outlets boils down to this adolescent, self-praising, tribalistic license: we have the right to do X, but they do not. Indeed, the entire debate over whether there should be a war with Iran over its nuclear enrichment activities, as Israel sits on a massive pile of nuclear weapons while refusing UN demands to permit any international inspection of it, is also a perfect expression of this mentality. The ultimate irony is that those who advocate for the universal application of principles to all nations are usually tarred with the trite accusatory slogan of “moral relativism”. But the real moral relativists are those who believe that the morality of an act is determined not by its content but by the identity of those who commit them: namely, whether it’s themselves or someone else doing it. The picture at top is a handout picture released by the Syrian Arab News Agency which purports to show damage caused by an Israeli strike on May 5. It is an AFP/Getty Image that appeared in the Guardian. 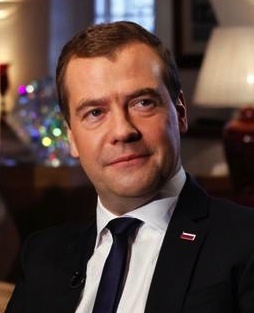 The picture of Russia’s Prime Minister Dmitry Medvedev, is from The Independent. Another nice piece by Jim Wall. Well, there are some Americans who protest this stupid American support of Israel’s illegal acts…evidently America commits so many illegal inhumane acts its self, that it no longer has leadership with a conscience! Well, there are millions of Americans who do have a conscience and we are trying very hard to awaken the conscience of our fellow Americans!